TORONTO, ONTARIO–(Marketwired – March 28, 2016) – Tellza Communications Inc. (TSX:TEL) announced its audited financial results for 2015. Revenue for 2015 was USD$306 Million compared to USD$243 Million in 2014 an increase of USD$63 Million or 26% year over year. 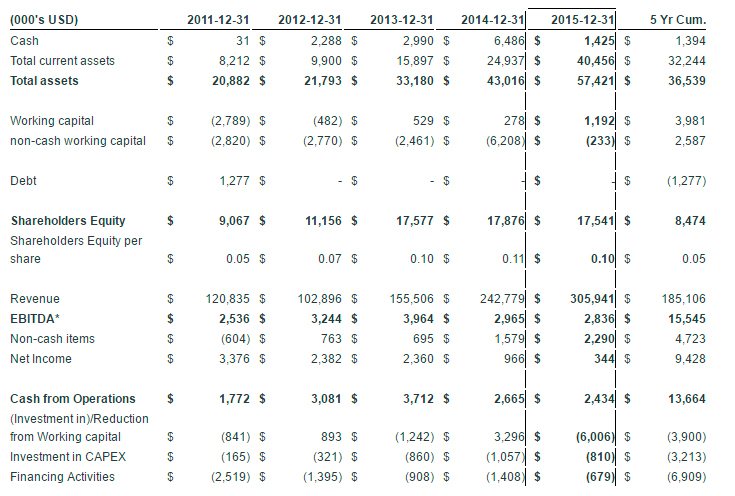 EBITDA* was USD$2.8 Million compared to USD$2.9 Million in 2014. While we conduct our business primarily in USD, we are based in Canada and our common shares are listed and traded on the Toronto Stock Exchange in CDN dollars. Reporting in CDN dollars, our EBITDA* is CDN$3.8 Million for 2015 compared to CDN$3.3 Million in 2014. Net Income was USD$0.34 Million compared to net income of USD$1.0 Million in 2014. The decrease in Net Income is primarily related to increase in non-cash impairment of the underperforming Tel3 business unit. Tellza has grown its revenue from USD$121 Million in 2011 to USD$306 Million in 2015, an increase of USD$185 Million over five years. During this period, Tellza earned USD$15.5 Million of EBITDA* and USD$9.4 Million of Net Income. Tellza produced USD$13.7 Million in cash flow from operations over this five year period, including USD$2.4 Million in 2015. Tellza invested a net USD$3.9 Million in working capital; including USD$6.0 Million in 2015. Tellza has also invested USD$3.2 Million in next generation networks and enterprise wide systems to automate traffic, transactions and workflows end to end, while investing another USD$3.0 Million in technology rights and know how to allow it to remain competitive as margins reduced in its business/industry segment. Tellza has also ensured that its growth has come within its means by: 1) nearly doubling its shareholders equity over the last five years, 2) deleveraging the Company by becoming debt free and 3) ensuring it has adequate liquidity in the form of a CDN$6.5 Million unused credit facility as at the end of 2015.